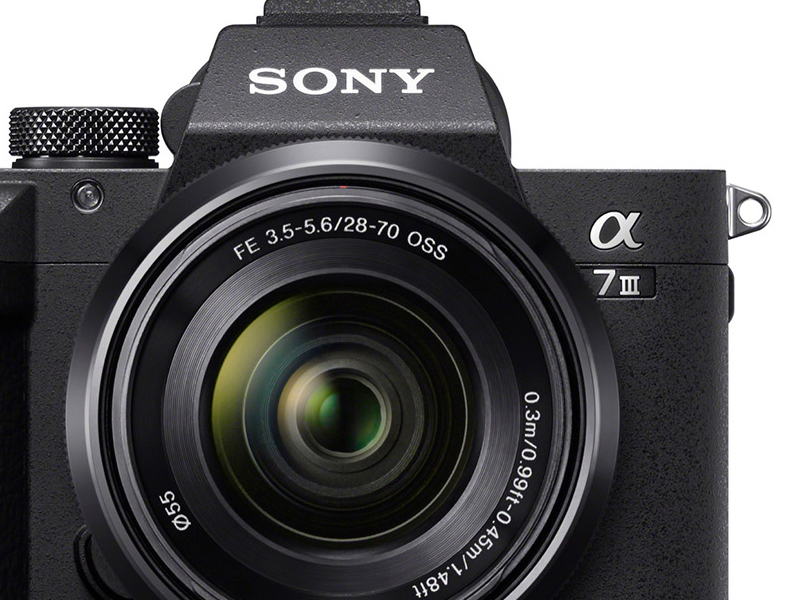 Sony Electronics, a worldwide leader in digital imaging and the world’s largest image sensor manufacturer, has today introduced yet another impressive addition to their full-frame mirrorless camera lineup, the α7 III (model ILCE-7M3). 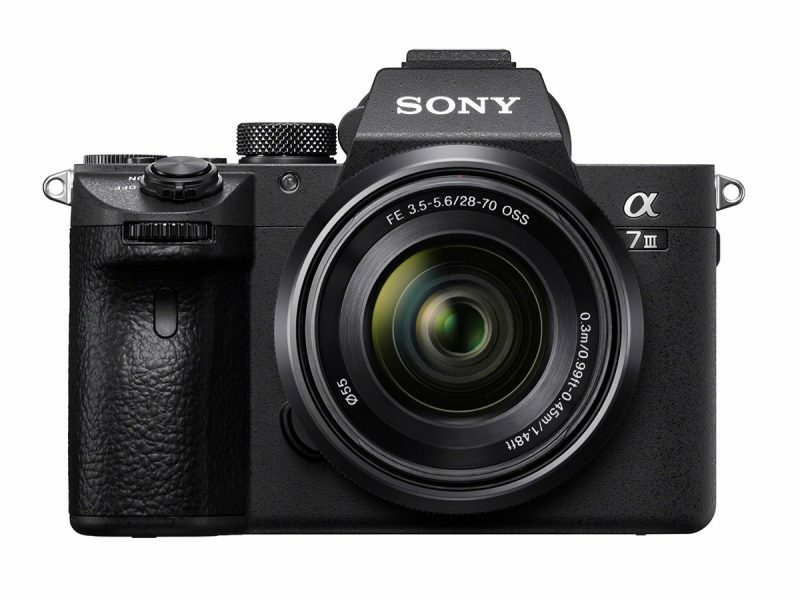 This new full-frame model can also output 14 bit RAW format [ix] even in silent and continuous shooting modes, and is equipped with a 5-axis optical image stabilization system that results in a 5.0 stepv shutter speed advantage. 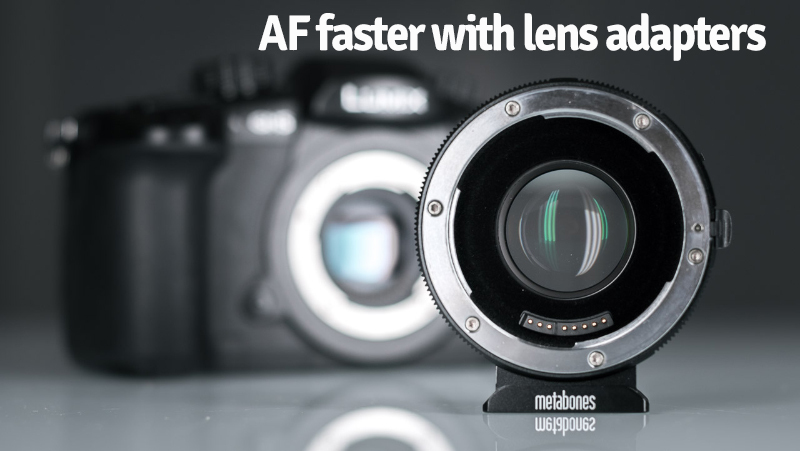 The acclaimed Eye AF feature is also available in the new camera, even in AF-C mode, which is extremely useful for situations where the subject is turning around, looking down or otherwise obstructed. It also works when the α7 III is being used with Sony’s A-mount lenses with an optional LA-EA3 adaptor [x]. Additional improvements in focusing flexibility include the addition of a multi-selector or ‘joystick’ for moving focusing points quickly, the addition of touch focusing capability, AF availability in Focus Magnifier mode, an ‘AF On’ button and much more. 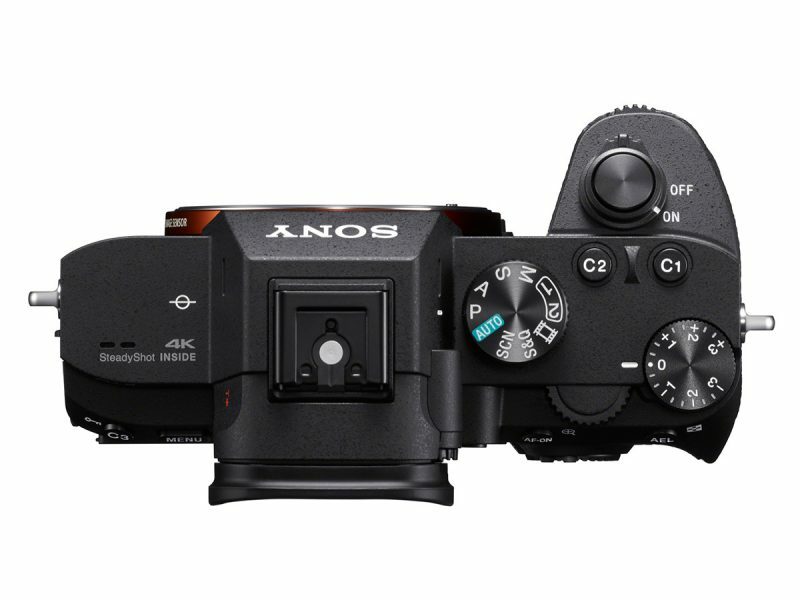 The new α7 III is an outstanding video camera as well, offering 4Kvi (3840×2160 pixels) video recording across the full width of the full-frame image sensor. In video mode, the camera uses full pixel readout without pixel binning to collect about 2.4x [xiii] the amount of data required for 4K movies, and then oversamples it to produce high quality 4K footage with exceptional detail and depth. 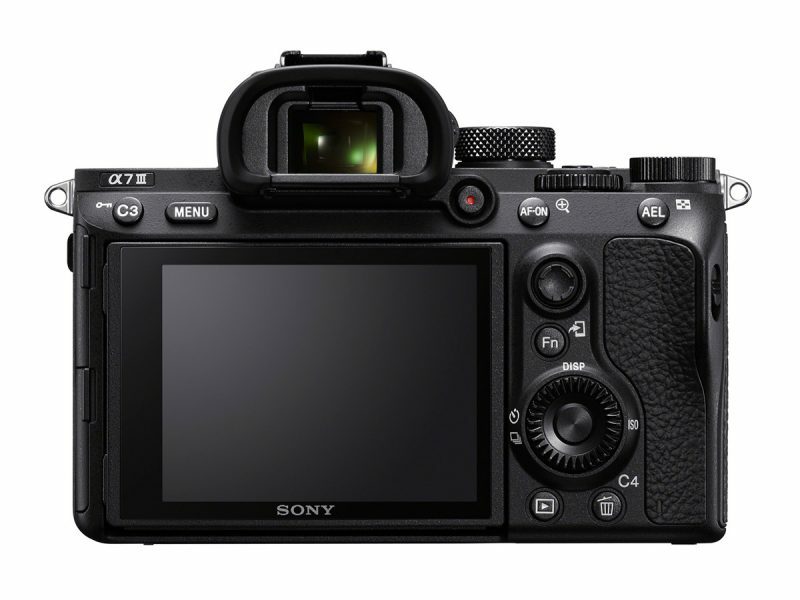 An HLG (Hybrid Log-Gamma) [xiv] picture profile is available on the α7 III as well, which supports an Instant HDR workflow, allowing HDR (HLG) compatible TV’s to playback beautiful, true-to-life 4K HDR imagery. Further, both S-Log2 and S-Log3 are available for increased color grading flexibility, as well as Zebra functionality, Gamma Display assist and proxy recording. The camera can also record Full HD at 120 fps at up to 100 Mbpsvi, allowing footage to be reviewed and eventually edited into 4x or 5x slow motion video files in Full HD resolution with AF tracking. 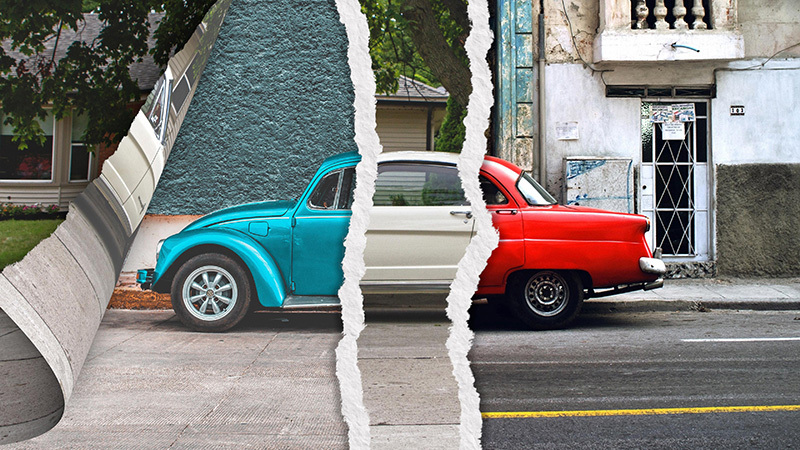 A cracking set of 3D rip effects from idustrial Revolution. 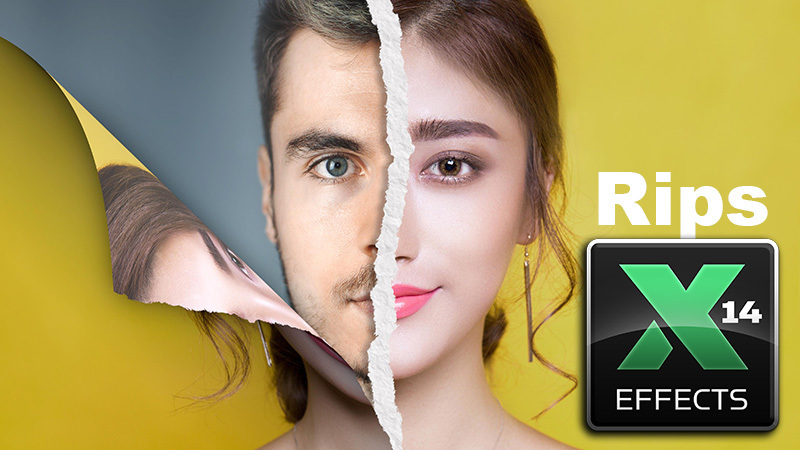 Each plugin comes with 10 pre-loaded edges that can be offset for a realistic rip. Use any media including video or stills. Available exclusively for Final Cut Pro. 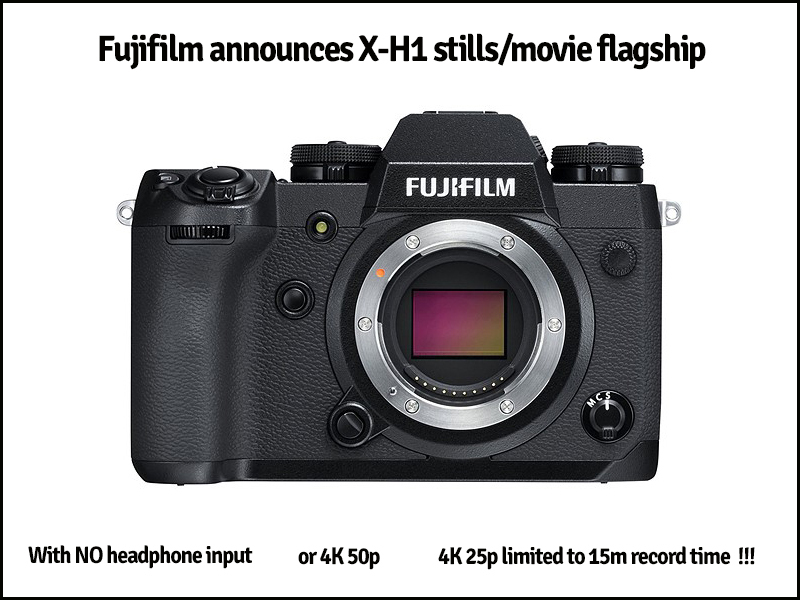 New Fuji X-H1 stills/movie flagship ! I can’t understand why this is promoted as a movie flagship camera when it clearly has problems recording beyond 15minutes, this is a bad limitation for any movie camera. Having no headphone socket, how can you produce any dialogue with no sound monitoring. When you compare this to a Panasonic GH5 for video there is no comparison, why do manufacturers not see this. Update : I have just been informed that you get a headphone socket when you buy the optional battery grip and extended 4K video filming as well. 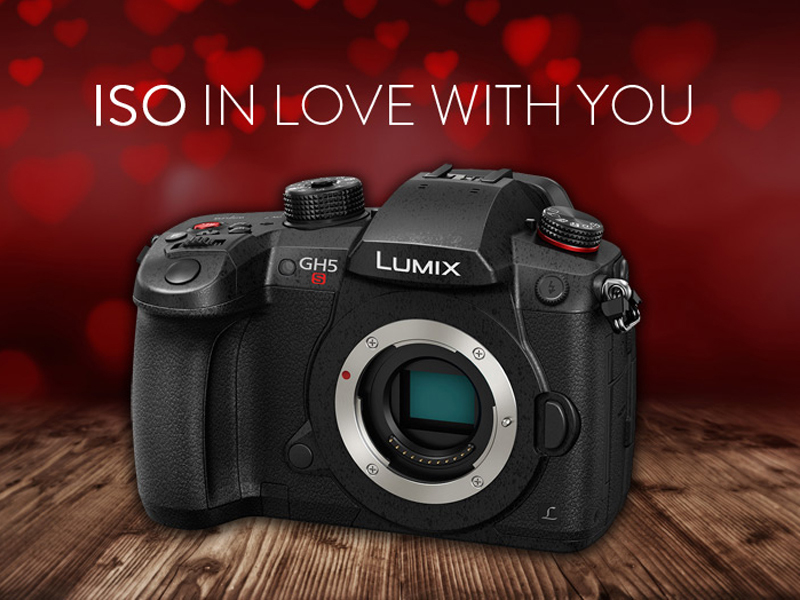 Sorry had to show this from my mailing list…The lads at Production Gear are at it again with this well chosen wording to celebrate St. Valentines day. Before we all get too exited this fix only works with lens adapters and at 25p and has no effect on Lumix lenses. I do not work with angles as I prefer shutter speeds but the fix also works with Syncro scan switched on. I did not appreciate the way this news was and is being presented as its only useful for anyone using lens adapters, this is not apparent till you watch the video. Here is the original video posted by YodaYeo the chap who discovered the solution my thanks to Timothy Bates for sending me this link. 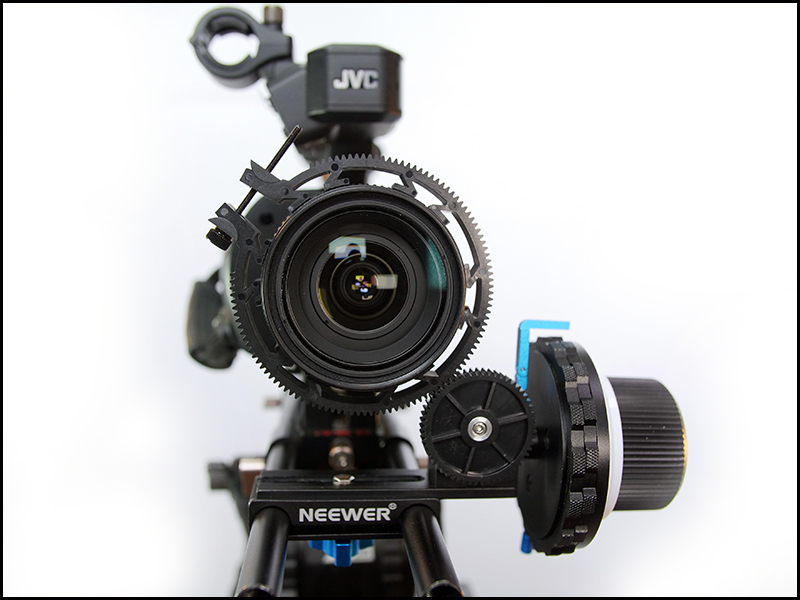 User Review NEEWER Follow Focus £39 plus an extra £12 for alternative gears. 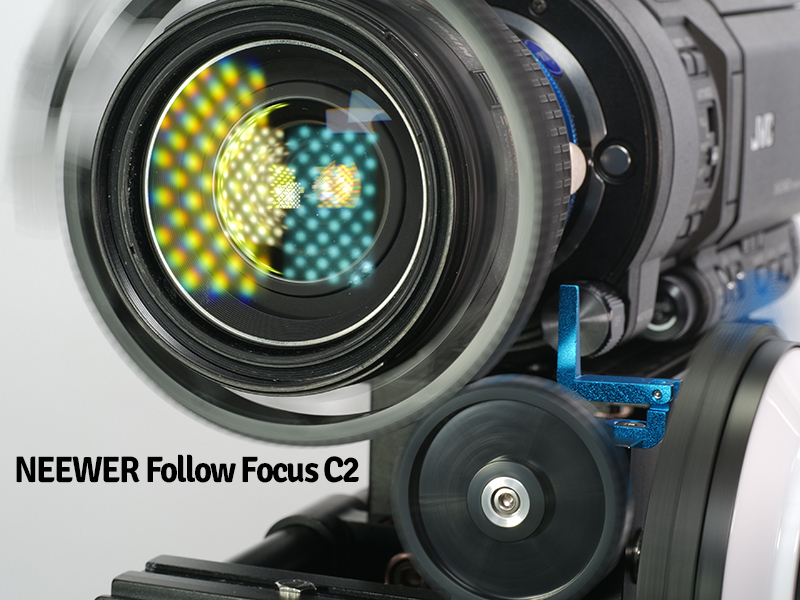 Can you get quality for less than £40 in the film industry, well it seems so with this NEEWER Follow Focus unit, very impressive, apart from the lens gear ring. 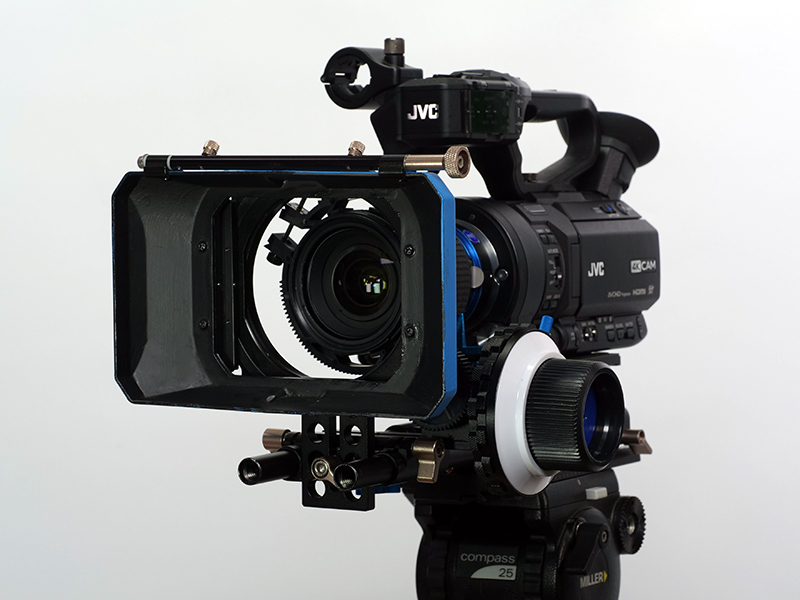 My JVC LS300 is heading over to Arran to film a pilot comedy film in 4K 25p and I thought a follow focus unit would make it easier to use. I am using a older Nikon 24-85mm zoom lens which will give an equivalent field of view on the Super 35mm sensor of 36-127mm (1.5x). Back to the gear ring that comes with the Neewer Follow Focus unit, shocking design. As you can see it has not got the ability to adjust to fit the diameter of the lens and sits proud of the lens. Fortunately scanning Amazon I found this properly adjustable gear ring from Movo, you get a set of 3 for just over £12 a 67mm, 75mm and an 85mm. I like the way the plastic grips and cushions the lens barrel. 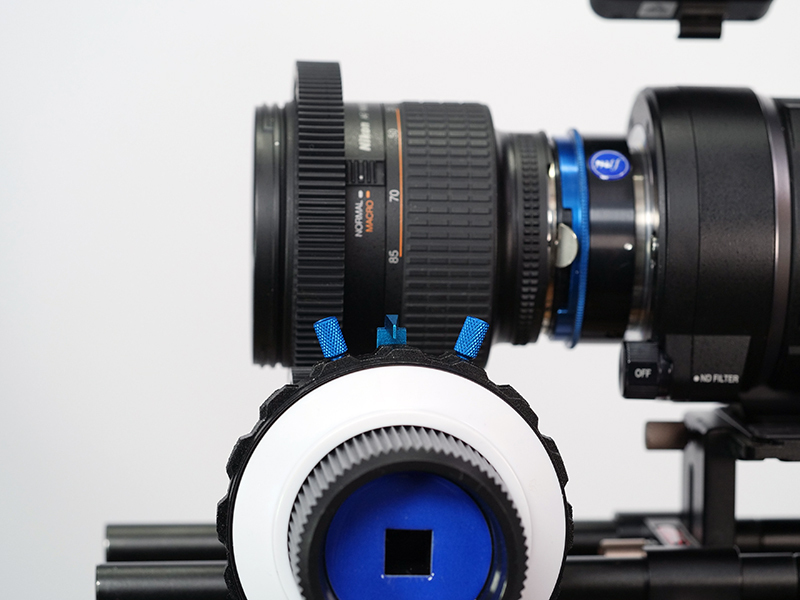 As you can see the Neewer follow focus works well with the MOVO gear ring. You even get adjustable end stops allowing you precise pull focus positions. Having had a loan of a £600 Cambo follow focus in the past I was very reluctant to buy the Neewer as I was not expecting much for my money. To my surprise it was a lot better than I had anticipated. 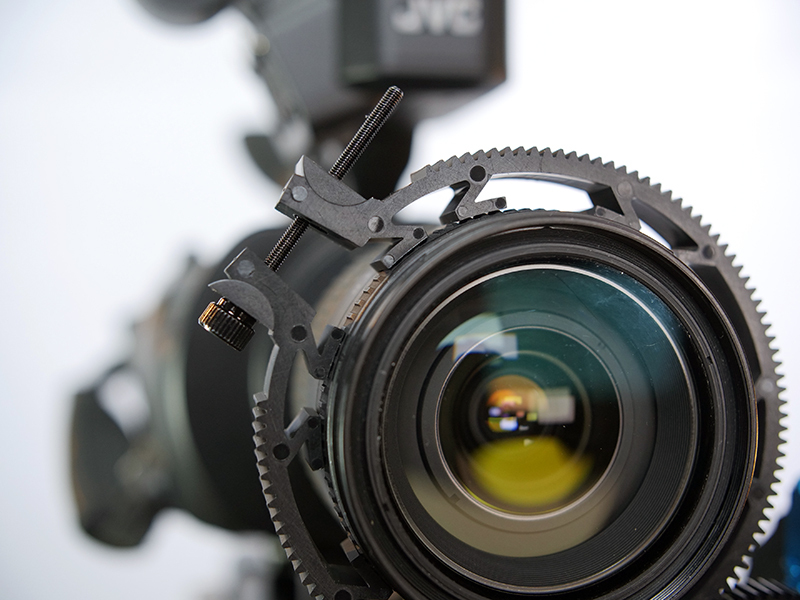 I did try it on my Panasonic GH5 but with the fly by wire focusing you don’t get the same definitive end stops of a manual lens although it did work I prefer to use it with the JVC LS300. 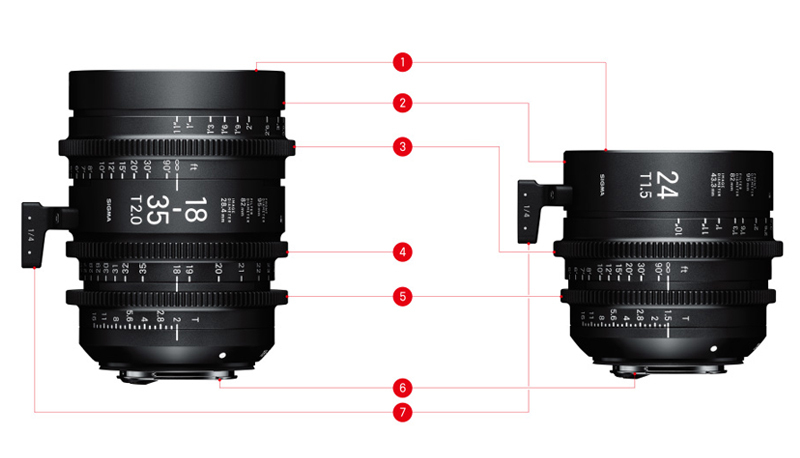 Marks out of 10…I will give the Neewer Follow Focus a 9 out of 10 losing one point for the badly thought out gear ring. One of my all time favourite lenses is my Sigma 18-35 f1.8 ART lens with my Metabones adapter on my GH5. Although this is an older story its worth another look as the line up of cinema lenses is fantastic. 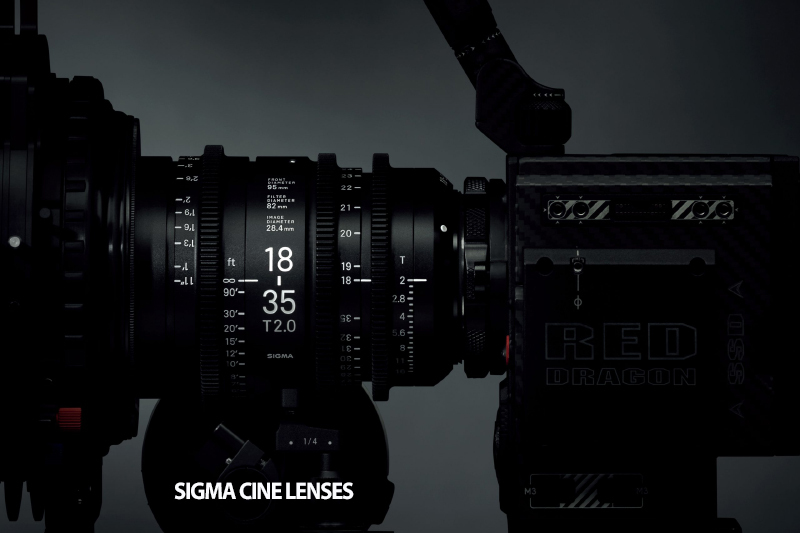 SIGMA timed the announcement of its new line of cinema lenses, the ‘SIGMA CINE LENS’, in conjunction with the broadcasting general trade show; ‘IBC’ ( International Broadcasting Convention) held in Amsterdam, the Netherlands on the 7th September 2016. We had heard of stories for some time that SIGMA lenses had become a favorite among many users who customized their interchangeable photographic lens (‘still lens’), alternatively using them in film production shoots. We gained a reputation for our ‘motion picture lenses’ from professional users around the world, particularity through the outstanding optical performance of the Art line. Its innovative image quality that SIGMA pioneered shone through in a world of remarkable high-resolution digital photography and performance-centered lenses. “The mere mention of movie-making equipment from the past would bring to mind equipment made according to enormous Hollywood budgets, a very special world beyond our reach. As well as there being a small number of manufacturers and choice available, they were incredibly expensive. It was with the advent of shared video content services like Youtube thriving over the past 10 years that the game has greatly changed. Content like web promotion and video clips for music and videos have become the norm. And at the same time, there has been an increase in individual and small-scale productions, that is to say the stage of the so-called independent producers has become bigger”. 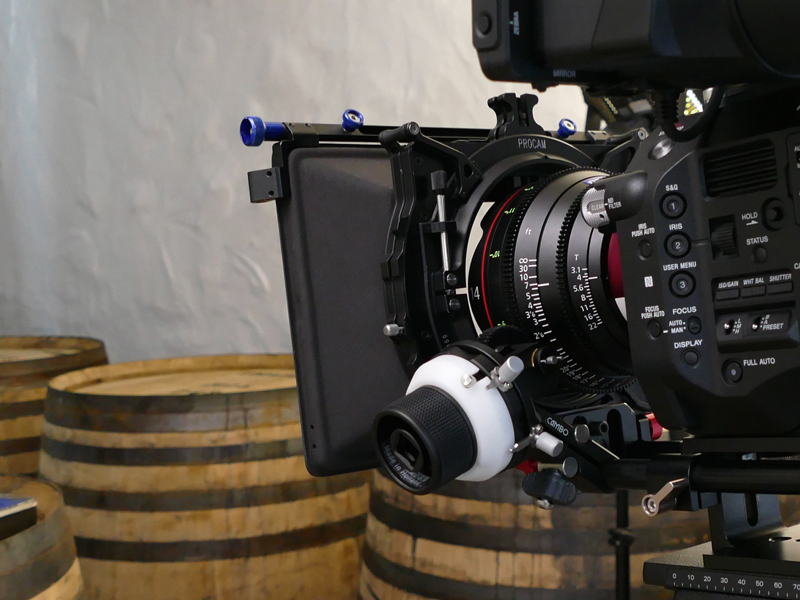 “One of the factors that has lead this change is the evolution of filming functions on SLR cameras, and the rise of small yet high-performing digital cinema cameras. The price of one camera in Hollywood was on a par with a high-end imported car. 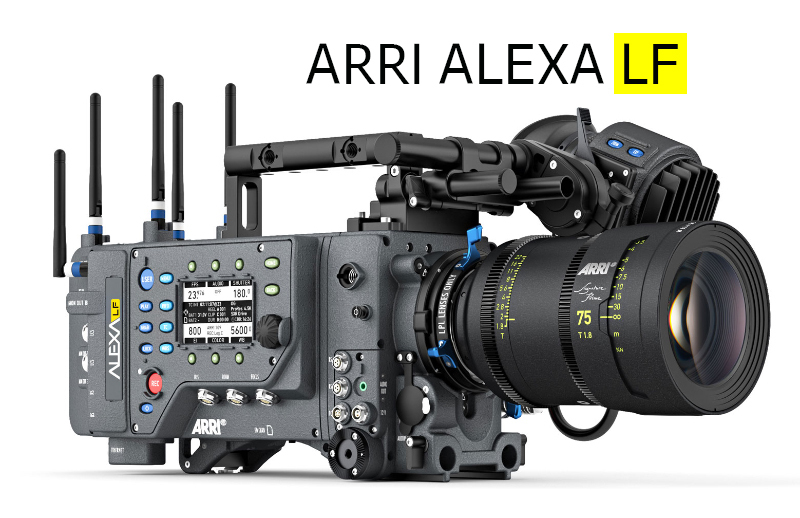 In other words, in a world where it was common knowledge that movie cameras would cost more than $100,000, it could be said that a rather drastic change in price has occurred. It was the introduction of innovative cameras, with outstanding high-quality imaging, that has changed the situation. The cameras are also at a much more reasonable price than what is expected from a camera with a seamless balance of data handling and compactness. 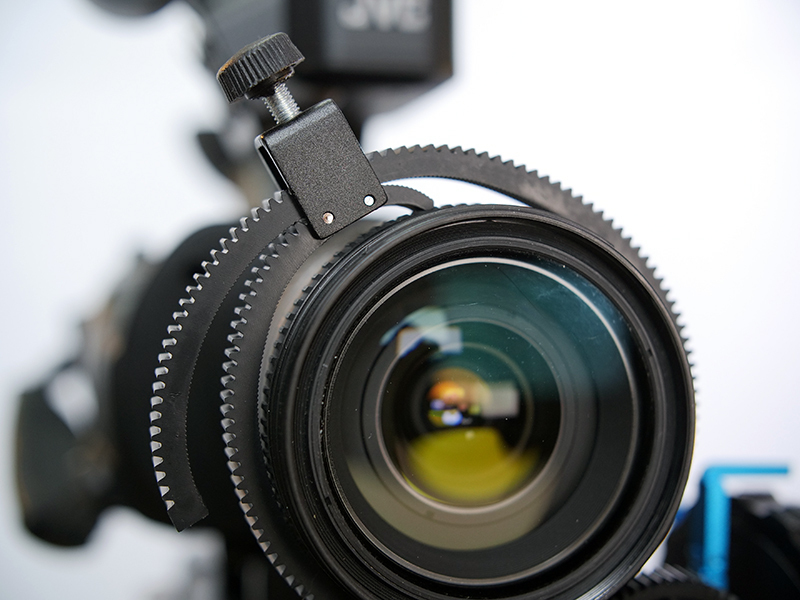 In the movie making industry, equipment is judged on the basic premise that “price of equipment equates to performance”. Without an ample budget, there was the problem of not being able to get hold of good quality equipment. 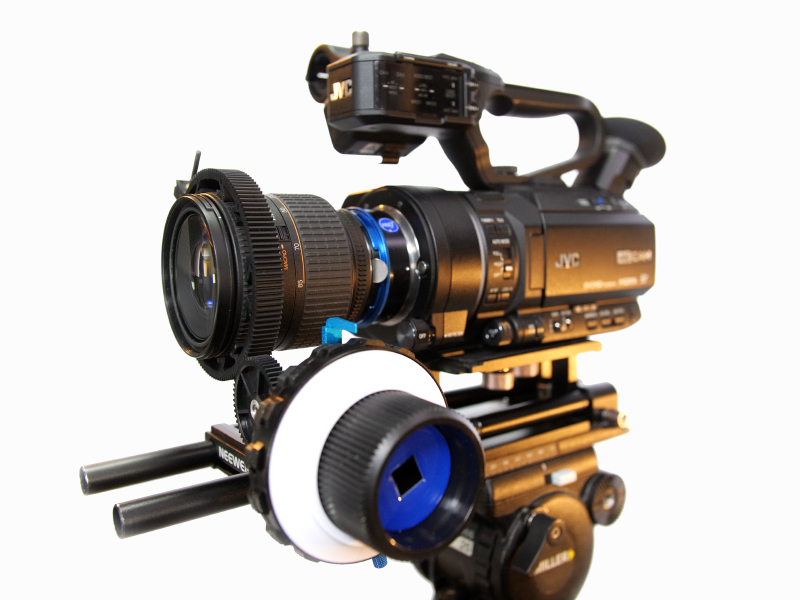 With these digital cinema cameras becoming more prevalent, the doors have opened where even with a small scale budget, a movie with high-performance equipment and high-production values can be made. In a world that places demands on the quality of a single frame, SIGMA had gone ahead and delivered the high-performance Art line series of lenses for high-resolution photography. 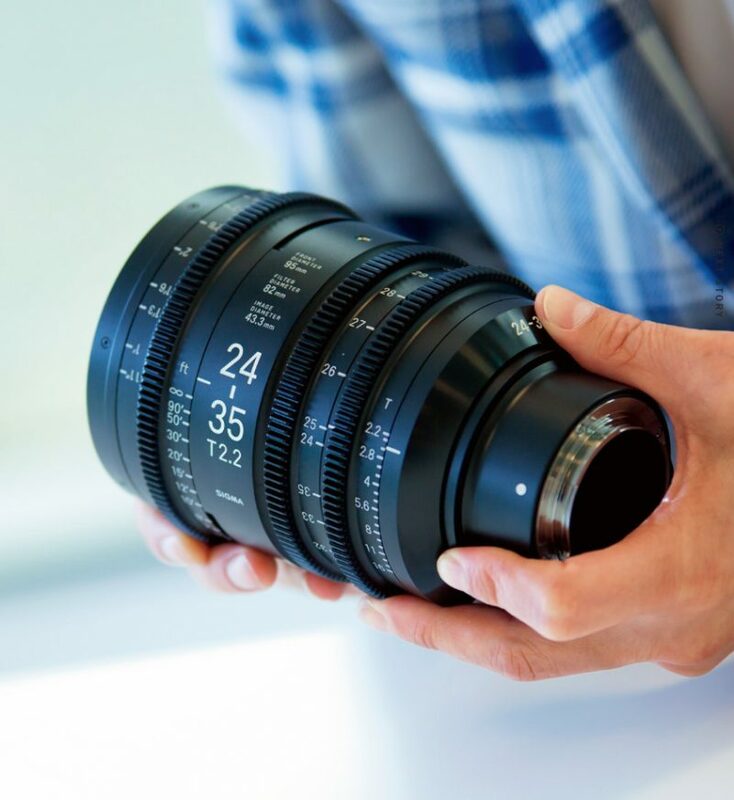 So for SIGMA, who had established the developmental know-how and mass-production technology to achieve this, there was no technological hurdle to overcome to develop the CINE LENS. 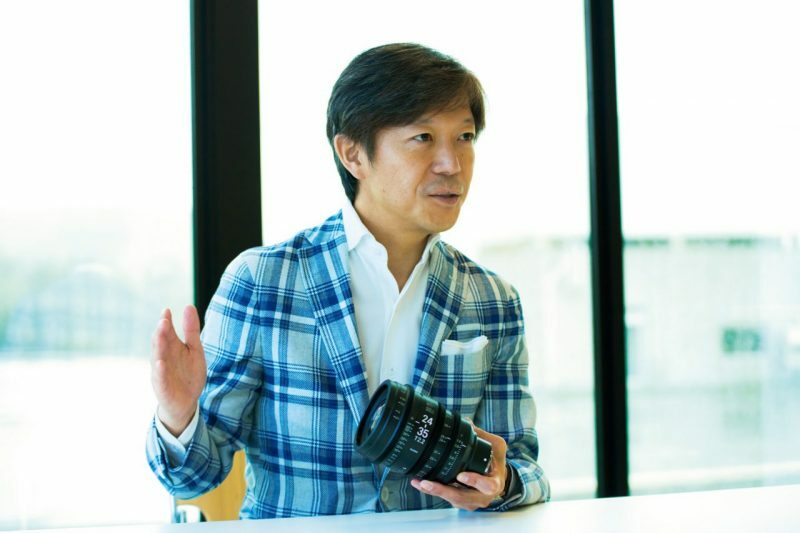 As Yamaki explains, “Of course, we could develop a dedicated cinema lens, but the market was so small that to start from zero would not be effective for mass-production. 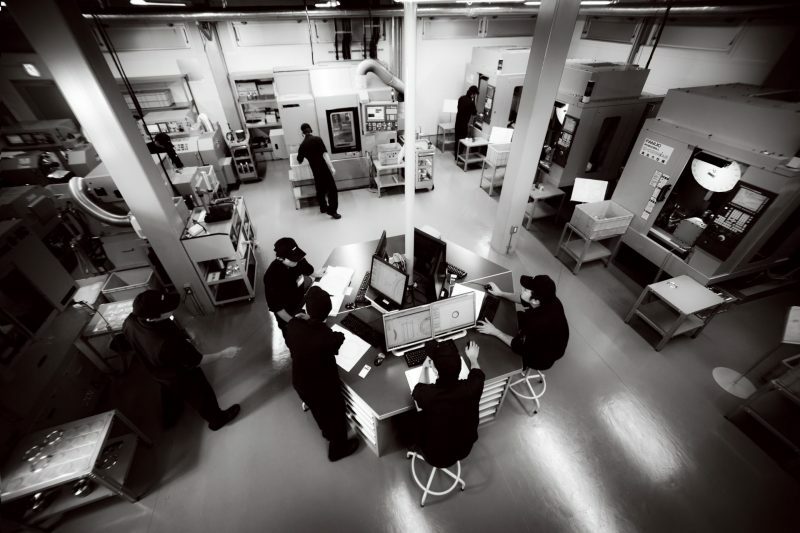 However in regard to the development of the optics, the most important and difficult component with the biggest impact on cost, we copied the existing high-performance Art lens we had available. 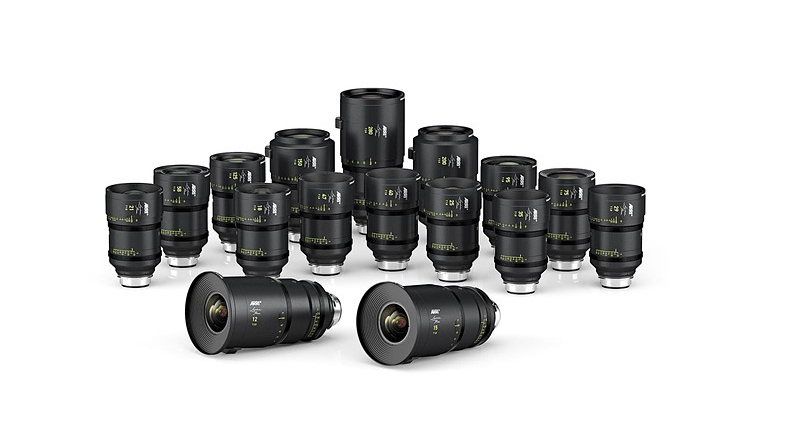 By configuring the mechanical structure toward cinema, we were confident we could make a landmark lens that combined the high standard of Art with compactness at the minimum of cost. Can you believe this major fault found only by accident by a colleague of mine during a live theatre show. He was filming the show as a 3rd camera and accidentally pressed the green playback button when the GH5 stopped recording and went into playback mode. This has be be one of the worst mistakes I have found with the GH5 so far and Panasonic need to urgently address this with a firmware update. As it was a 3rd camera there will be no consequences to his recording but had it been a single camera it would have been a disaster. The same happens with the GH5S as well !!! It has been pointed out to me this problem has existed over a few incarnations of the GH line from the 3,4 and now 5. 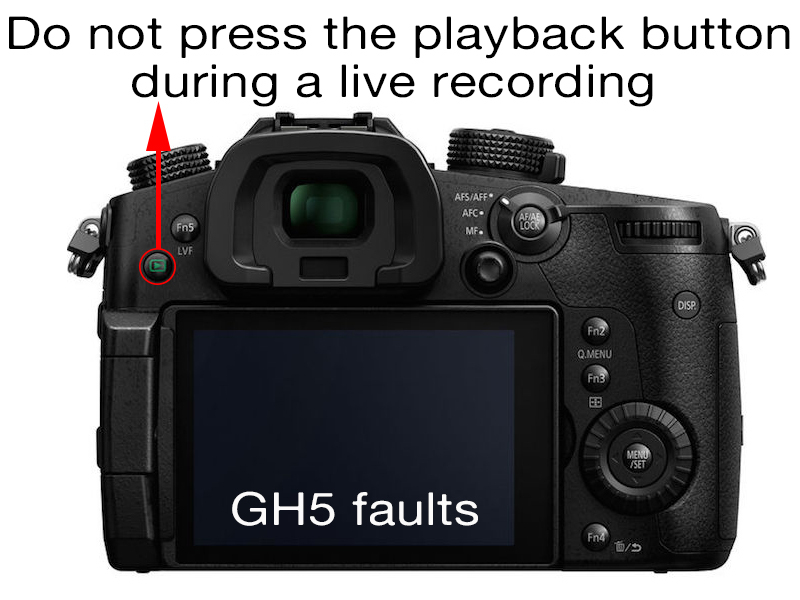 This is no excuse for sloppy engineering, if Panasonic want the GH5 to be taken seriously within the video world then a simple menu addition needs to be added allowing users to deactivate the playback function during recording.